With council candidate nominations now closed, West Fife and Coastal Villages councillor, Bill Walker, has wished the best of luck to two candidates hoping to replace him in Fife Council in May. Last year, Mr Walker announced his decision to stand down from the Council to concentrate fully on his new role as Dunfermline MSP. His potential replacements are West Fife community education veteran Kate Stewart and health campaigner Len Woods, both representing SNP. Electors will be voting to select a total of four councillors for the West Fife and Coastal Villages and can choose their candidates in order of preference. Mrs Stewart has spent 29 years as a council worker in community education and is a member of various community groups. In the past six months, she has secured £40,000 funding for local community projects. Mr Woods, who was born and raised in Dunfermline and now lives in Saline, is a vigorous campaigner for Action for Patients at the Queen Margaret Hospital. He has previously served as a councillor in Dunfermline and remains very active in the community. MSP Mr Walker said: “I’ve known Kate and Len for many years. 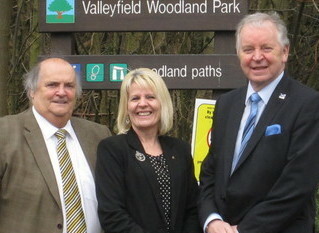 They both care deeply about West Fife and are extremely hard-working. They have put in so much work for the community — not simply in the run up to the elections – but all their lives.